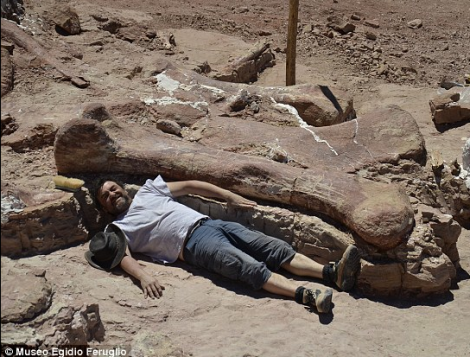 Fossilized bones of LARGEST EVER dinosaur to roam the Earth found in Patagonia, Argentina – Blog von Peru Reiseveranstalter Chirimoya Tours. 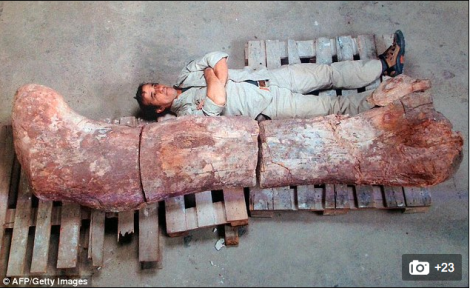 A local farmer in Argentina found the remains of the fossilised bones of the biggest dinosaur ever discovered. Palaentologists believe it is a new species of titanosaur- part of a diverse group of sauropod dinosaurs that were characterised by their long necks and tails and small heads. The mega dino would have weighed in at 77 tons, making it seven tons heavier than the previous record holder, Argentinosaurus, or as heavy as 14 African elephants! According to the measurements of its gigantic thigh bones, the herbivore would have been 40m (130ft) long and 20m (65ft) tall. The creature, which lived in the forests of Patagonia between 95 and 100 million years ago, was yet to be named.